Meet Mason Cox, a 211.4cm prospect from the US who will join Collingwood in season 2015. 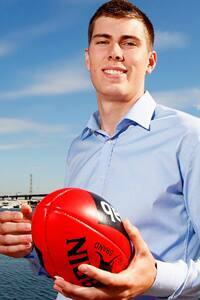 Meet Mason Cox, who has joined Collingwood from Oklahoma State University (OSU). Cox will arrive at the Westpac Centre in August as the tallest player ever measured at an AFL Combine, standing an imposing 211.4 centimetres. Collingwood has secured the services of exciting former US college basketball player Mason Cox. The Collingwood Football Club is delighted to confirm it has secured the services of exciting former US college basketball player Mason Cox. Recruited from Oklahoma State University (OSU), Cox will arrive at the Westpac Centre in August as the tallest player ever measured at an AFL Combine, standing an imposing 211.4 centimetres. Projected as a potential ruck or key position player, Cox was the standout performer at last month’s US International Combine in Los Angeles, with his supreme athleticism drawing plaudits from recruiters across the AFL. General Manager, List Management, Derek Hine expressed his delight at Cox’s recruitment, who will join Collingwood as a Category B rookie. “There was a fair degree of interest from other clubs, so we’re delighted Mason has decided to join us and we believe will be a long term player for the club,” Hine said. “Mason’s testing results stack up favourably against athletes who have never played football previously but have successfully made the transition to the AFL. “That gave us a confidence that there’s a foundation to work from, and more importantly, it gave Mason confidence the he potentially has the traits which can translate into an AFL career. Cox enjoyed an unorthodox path to elite college basketball, recruited as a walk-on member of OSU’s basketball program despite having never played the sport at any competitive level. The Texan native instead was acquainted with a round ball of a different variety, featuring as a goalkeeper for his high school and as a member of Major League Soccer side FC Dallas’ youth program. Dedicated to his academic pursuits, Cox was nearly two years into a degree majoring in mechanical engineering when he was invited to join OSU’s Big 12 roster after drawing the attention of coaching staff while assisting the college women’s team. Cox would ultimately spend three seasons on OSU’s roster, including the 2014 NCAA Tournament, and earned selection as a first team Academic All-Big 12 during his junior season in 2012/13. Boasting such a diverse sporting background, Cox’s considerable appetite for the challenge posed in making the leap to AFL proved impressive, while Hine believes the ease with which he entered OSU’s basketball program provides indication of his intelligence and adaptability. “Mason is very clear in the challenges he faces in his transition to AFL, but he is a competitive young man who is going to attack the task with intent. He is really up for the opportunity,” Hine said. “If you look at his basketball background, Mason went to OSU as predominately a soccer player, having played no real structured basketball, and ended up featuring regularly, which is an example of his ability to learn and pick up skills.